If you have owned your current home for a couple of years, you may be considering selling and buying a new build or make some improvements to serve your current needs and liking. 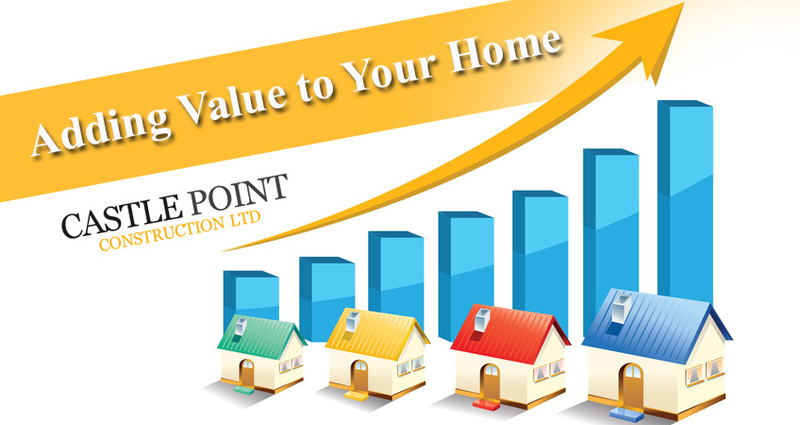 This has always been a common dilemma for most home owners, irrespective of your decision, renovating and remodelling your home is inevitable, if you are to get the best value from your investment. Having worked on thousands of home upgrade project or house extension projects, Castle Point Construction engineers have discovered that remodelling your home can give it the modern style you desire, as well as attract more buyers when you plan to resell your property. However, though there are many ways of upgrading an old home, not every renovation project will increase the value of your home. This article takes you through some of the key home remodelling ideas for guaranteed 100% ROI or more. Why do You Need Home Upgrade? Every person has a dream home that is designed according to their style and taste. However, not all are able to plan and build their homes from scratch meaning for some reason some us have to settle for ready-made homes. With a few remodelling, you can easily transform the design of your current home to the one you have always desired. I would like to think that when buying a home you look for a property with many features similar to your ideal home, thus you may only need to modify a few section to enjoy additional comfort and luxury. This can mean reinventing your living space, modifying the landscape, and changing the main gate or adding a conservatory. Modern home renovations such as changing the floor layout, increasing the living space and many other makeovers will satisfy your family needs as well as increase your home resale value. Additionally, renovating a rental property can be assure way of boosting returns on your property investment as more tenants will be willing to live in your premises and to pay higher rent rates. Though renovations can at times be expensive, home improvements such as replacing your plumbing system with more energy efficient and eco-friendly solutions can reduce your utility bills by half. Moreover, upgrades will increase your home life span lowering your maintenance and repair costs. Your family could have grown with time and you need more space to accommodate your family demands. You may invest in home extension projects to add an extra bedroom, expand the living room, and transform wasted loft area or convert your basement for more useful purposes to ensure efficient use of available space. Your home could have been built many years ago in an old fashion style, with renovations, you can give your home a modern design that is more welcoming and attractive. This can be a key factor to attracting potential buyers. If your home no longer meets your demands, you may be considering moving out as the ultimate solution. Well it could be. But have you considered the challenges and costs of buying a new home and relocating. Probably not. Buying a home is not a simple process. You will need time to search and inspect the house as well as pay fees. Considering the cost, you will find that it is easier to redesign your current home for your custom lifestyle and save thousands of pounds. As a matter of fact, you may still have to upgrade some features of the new homing adding more costs to your budget. What do You need to Consider When Planning a Home Upgrade? If you are redesigning your home to live in, the changes you make should address your current and future needs. Think about the size and growth, your lifestyle, taste and preference. You may focus on home extension to create rooms for the growing kids or guests, outdoor living area, modern kitchen, improving energy efficiency and landscaping among other enhancement. When upgrading an investment property, you should concentrate on changes that will boost revenue for collected rents and minimize the maintenance costs. Focusing on the right areas based on your tenants’ requirements will attract the tenants and earn you higher rents. Having a clue of potential buyer will give you an idea of the necessary renovations. Are you targeting a buyer with a family or the young generation? You may need to do a simple market research in the locality to find out who are likely to buy your home. Though it is almost impossible to know the specific buyer, you need to work on general features that can attract buyers putting your preference aside. The neighbourhood can also help you predict the future buyers of the properties. For instance, if your structure is near a hospital, your renovations should target medical professionals working there and so on. Additionally, you should improve on both the interior and the exterior of the house to uplift the appearance thus attract potential buyers. Which are the Areas that Need Remodelling? There are many changes that you can implement to add more value to your home. Based on the need of the future occupants, you need to identify improvements that can maximize the value of your property. It can be basic upgrade, kitchen and bathroom enhancement, doors and windows replacement, loft or basement conversion, or landscaping. Do you have the funds for the project? Most renovation projects are cost intensive therefore it is important to consider the tasks that can be completed with the available budget. It is advisable to work with experienced builders like Castle Point Construction to establish how much your project would cost. You may consider available financing options such as personal loans, building and construction loans, your savings and many others. Whatever renovation project you choose, you should target to maximize your returns. Take into account how much the project will cost, completion period and estimated value addition. A recent survey shows that home renovation can earn you a potential profit ranging between 48% and 108% depending on the type of changes undertaken. Applicable building and construction permits. The exterior space is an important feature that can highlight the beauty of your home. There are many landscaping changes that you can make including constructing modern patio and driveways, out-door shades, creating and maintaining a kitchen garden, and fixing the fence among others. Most home buyers consider the kitchen to be the heart of the home, so improving the kitchen is critical. Some of the most effective ideas are replacement of counter tops, fixing cabinets and changing the floor tiles. In the bedroom, you can enhance the fixtures, integrate tiling and storage space among other changes. Working on your old floor and wall is also important. This involves sealing of cracks, retiling, rebuilding walls and painting. Ensure that there are no flaws on the floor and walls. This may involve expending rooms to create more space or building new extension rooms, if you have the available space. You can rely on Castle Point Construction to explore the possible extension options. This should focus on window insulation, natural lighting design and installation of energy efficient appliances. Replacing the old doors and windows and repairing broken locks can give your home a face lift. You can invest on high quality door and windows to minimize future repair and maintenance cost. You can maximize space by making use of loft space and converting basements into living room or bedrooms. No matter the purpose of the home upgrade, you should always focus on the changes that will add the most value to your home. You need also to plan ahead and pick your builder carefully to ensure that your home renovation project is completed in high quality and timely manners. If you don’t have enough funds, it is advisable to consider the most necessary improvements that will serve the needs of the home occupant and ensure high ROI. In every step of your project, it is important to consult a building and construction expert like us who are specialized house builders in Essex to avoid making mistakes that could degrade your home.